Lomography BelAir X 6-12 plastic toy camera with Fuji Astia 100F slide film. 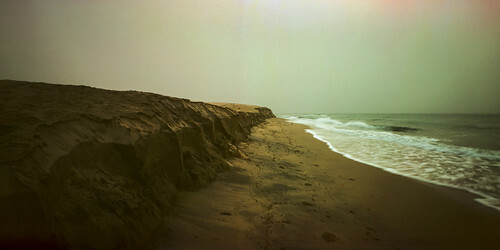 This is another picture off of this roll that I so badly underexposed and then underdeveloped. In other words, just about perfect for that Lomography je ne sais qua. It was, indeed, a gloomy morning with heavy overcast and a sandstorm picking up when I shot this so I like the way it captures the mood. I like the way this picture leads you down the beach. It's gloomy but also hopeful. And I love the way that pair of waves is breaking.